BARCELONA, Spain--(BUSINESS WIRE)--MOBILE WORLD CONGRESS – As consumer demand for high-quality content continues to rise, Western Digital Corp. (NASDAQ: WDC) is enabling a bigger, faster experience with new industry-leading solutions that give consumers the best combination of performance and capacity so they can do more with the rich content they capture. At Mobile World Congress, the company is showcasing the world’s fastest 1TB UHS-I microSD flash memory card, the 1TB* SanDisk Extreme® UHS-I microSDXC™ card. The new card features higher speed and capacity for capturing and moving massive amounts of high-quality photos and videos on smartphones, drones and action cameras. These impressive levels of capacity and speed give consumers the ability to create all the content they want without worrying about space limitations or long transfer times. G-Technology™, SanDisk®, Upthere™ and WD® brands. Western Digital, the Western Digital logo, G-Technology, Upthere, WD, SanDisk, the SanDisk logo, and SanDisk Extreme are registered trademarks or trademarks of Western Digital Corporation or its affiliates in the U.S. and/or other countries. The microSD and microSDXC marks are trademarks of SD-3C, LLC. All other marks are the property of their respective owners. Product specifications subject to change without notice. Pictures shown may vary from actual products. Not all products are available in all regions of the world. 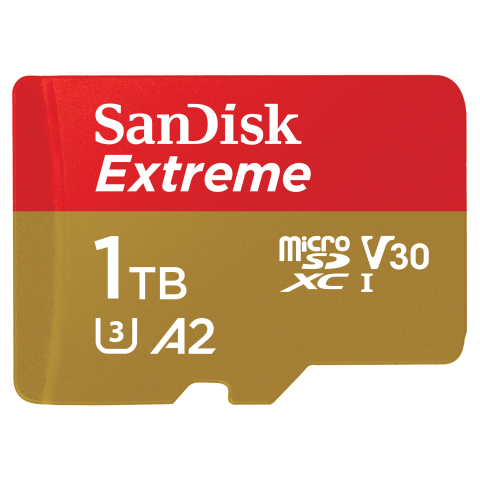 This news release includes forward-looking statements, including the expected availability, benefits, capabilities, capacity, performance, speed and/or other features of the SanDisk Extreme UHS-I microSD card. There are a number of risks and uncertainties that may cause these forward-looking statements to be inaccurate including, among others: changes to specifications from standards organizations, volatility in global economic conditions; business conditions and growth in the storage ecosystem; impact of competitive products and pricing; market acceptance and cost of commodity materials and specialized product components; actions by competitors; unexpected advances in competing technologies; our development and introduction of products based on new technologies and expansion into new data storage markets; risks associated with acquisitions, mergers and joint ventures; difficulties or delays in manufacturing; and other risks and uncertainties listed in the company's filings with the Securities and Exchange Commission (the "SEC"), including the company’s most recently filed periodic report, to which your attention is directed. You should not place undue reliance on these forward-looking statements, which speak only as of the date hereof, and the company undertakes no obligation to update these forward-looking statements to reflect subsequent events or circumstances.